The building that used to be the home of Twister: Ride it Out has been completely gutted. The inside has been stripped down to just the exterior walls and supports. In fact, an entire wall by where the pre-show and show building entrance used to be is completely removed, as in, no wall at all. To me, there is more than an enough room inside for a Soarin’ type ride system. If the entire queue is moved outside and they only use one pre-show instead of two, this building is big enough to hold a couple Soarin’ sized theaters if you ask me. And over in San Francisco the entire Beetlejuice stage has been leveled to the ground. Almost immediately after their last show the stage started to come down. Now we have a clear view of the King’s Cross station for the Hogwart’s Express train backstage. This means we’ve got a big hole in the park between New York and London, that is, until Fast & Furious Supercharged opens in 2017. Parts of the old Earthquake/Disaster building have also been demolished behind the Beetlejuice stage. The main entrance and preshow areas still stand, as well as all facades facing guest areas, but all of the backstage facing building seems to be coming down. See the construction photos below and stay tuned for more Universal news coming soon! A very empty building, all the way to the ceiling! Absolutely no remaining internal structure! View from the side. Will this be re-themed as 30 Rockefeller Center with a huge new facade? 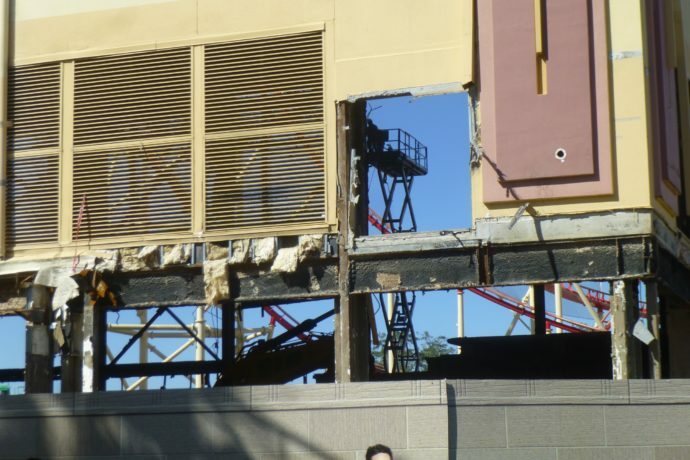 Behind the coaster supports, you can see that the ENTIRE WALL IS MISSING!!! Where’s Beetlejuice? Gone. That’s where. What little is left from the final destruction scene from Disaster. This is where the fake subway train was held before “crashing” into your tram on the ride. Walking down the street in San Fran. Parts of Frank Kincaid’s tentacle tank monster still remain, you’re welcome. Still no takers? C’mon people. We got cows! One of Frank Kincaid’s classic posters can be yours! Just another thousand bucks and it could be yours! I actually kinda want it, and I did not like that show at all! That’s all for this update. See my last update of the Hello Kitty store construction, and check back next week for Kong and Hulk coverage at Islands of Adventure!